Joby Talbot's cantata A sheen on the dew of flowers will receive its premiere on Thursday 11 April, 2019 as part of the celebrations for the bi-centenary of Queen Victoria and Prince Albert's births. Independent Opera will present the first public performance of the cantata at the Barbican when Natalie Murray Beale conducts the Britten Sinfonia and Britten Sinfonia Voices with soloists Kelley O'Connor (mezzo-soprano) and Tobias Greenhalgh (baritone). The cantata explores the themes of love and loss, setting texts by women from all over the world across three millennia, all translated into English by American poet Jane Hirshfield. Talbot took inspiration for the cantata from Queen Victoria’s sapphire and diamond coronet designed for her by Prince Albert in 1840, the year of their wedding. Queen Victoria wore the coronet that year in the famous portrait of her by Winterhalter, and she would wear it instead of the crown in 1866 when she opened Parliament for the first time since Prince Albert's death in 1861.. 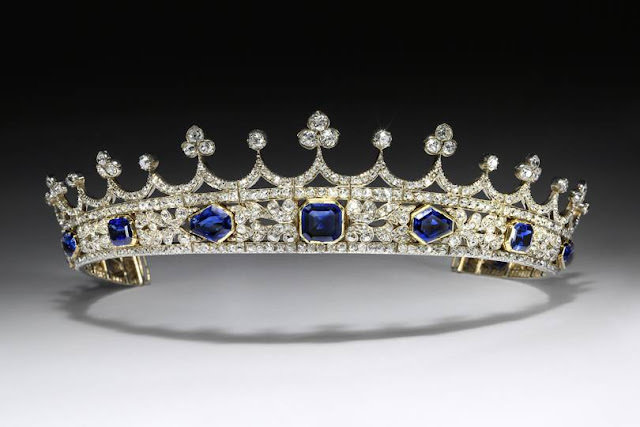 The coronet was purchased for the Victoria & Albert Museum in 2017 through the generosity of Independent Opera's co-founders, Bill and Judy Bollinger, and it will be on display from 11 April 2019 in the newly refurbished William and Judith Bollinger Gallery, a highlight of the V&A’s bicentenary celebrations, alongside events, displays and new publications. Since it was created, Independent Opera's Artist Support scheme has awarded scholarships, fellowships and one-off grants to 116 artists in the fields of singing, directing, design, choreography and production, as well as providing professional mentoring support. Full information from Independent Opera website. Apologies, should have spotted that! All corrected.